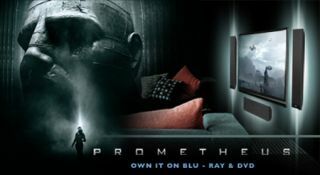 KEF teams up with 20th Century Fox for Prometheus competition | What Hi-Fi? Here’s your chance to win a luxury holiday in Petra, Jordan, or a £2500 home cinema system with KEF T205 speakers, an Onkyo multichannel amp and a 40in Samsung flatscreen. It’s all part of KEF’s special Prometheus promotion, starting today, based around the Ridley Scott film on DVD and Blu-ray. For the next two months KEF dealers will feature Prometheus promotional material alongside KEF’s T-Series speakers in store, and anyone who buys a KEF product will be entered in a competition to win an all-expenses paid, five-star luxury holiday in Petra, where Prometheus was filmed. What’s more, anyone can enter a second competition online to win a £2500 home cinema system. Click here to enter.